Finally, a break in the weather. Clouds disintegrated and sunshine reached through their tattered remains to melt the snow that fell Christmas Eve. I took the Warrior aloft for mutual exercise; a nice, if routine, flight. Returning home above a 3,000 foot haze layer, I watched the sun descend through the misty surface, seeming to ignite the false horizon. As we inched closer to home against a monstrous westerly headwind, the sun appeared submerged in the vapor, its rays shifted crimson when viewed through the thickened lower atmosphere. A fitting way to close out an eventful year of flying, I think. When the days become short, gusty winds rob the body of heat with breathtaking efficiency, and footing is treacherous outside the hangar due to snow and ice, it is a good time to stay inside. Sitting in a comfortable chair and reviewing my logbook leaves me with a sense that 2013 was a year of significant change in my flying. Here is my annual review of the year's highlights along with some of my favorite photographs. I now own Warrior 481 outright. Three days prior to the ninth anniversary of buying the Warrior in Guthrie, OK, I made my last airplane payment. I earned my instrument rating! After over a decade of VFR-only flying, this required a significant mental adjustment for me in terms of go/no-go decision making. But I like having the new skill and the expanded envelope of capability. It's too bad that low, icy clouds of winter render the rating virtually useless this time of year. In 2013, I logged 21.8 and 5.7 hours of simulated and actual IMC flight time, respectively, with 48 approaches (15 ILS, 20 RNAV, and 13 VOR). 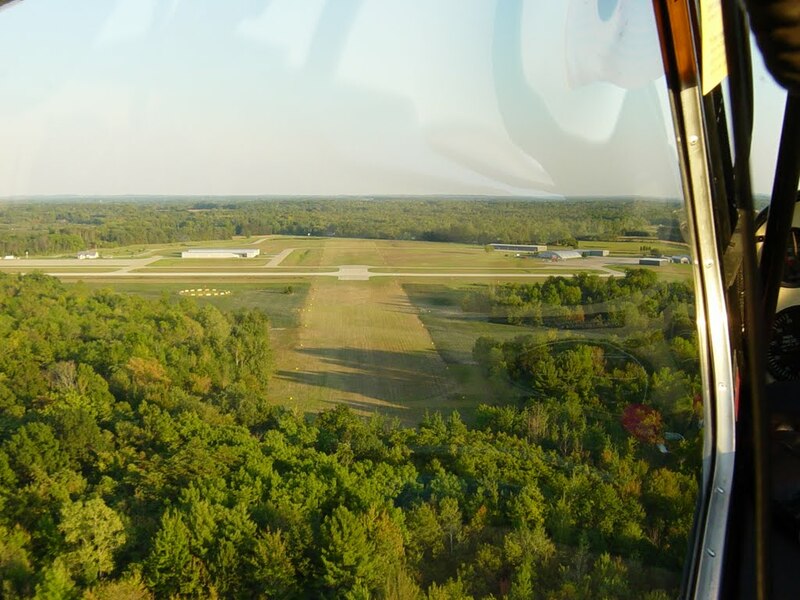 I moved from the Le Roy Airport to the Williamson-Sodus Airport. 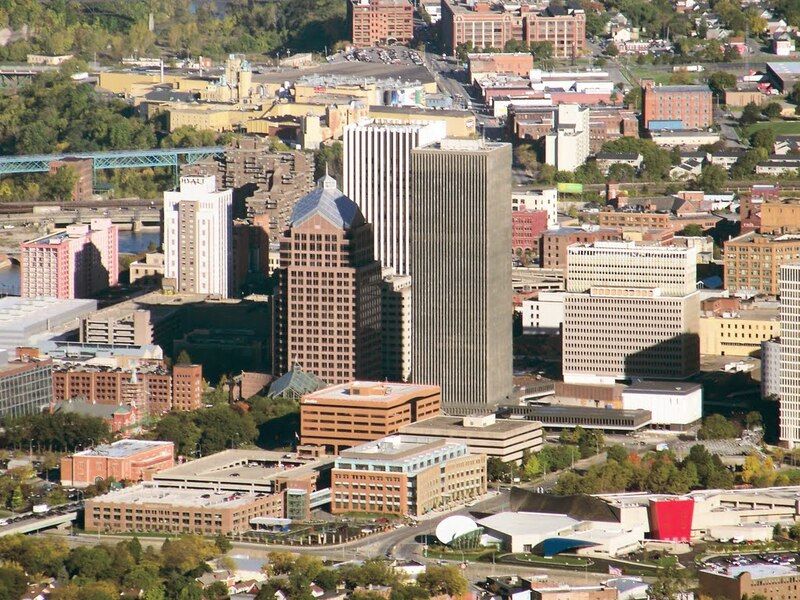 This was a tremendous change for me after seven years of considering Le Roy my home. While I will always have a special place in my heart for Le Roy and the pilots based there, the move shortened my commute significantly and brought me to a more active airport. I exchanged my iFly 700 portable GPS for an iPad using Foreflight/Stratus. The iFly is a great device with a remarkably intuitive interface and a terrific development team supporting it. When I began instrument training, however, I found it to be cumbersome for displaying/zooming approach plates. I already owned an iPad and needed a hardware upgrade to take advantage of ADS-B weather, so I chose the Foreflight/Stratus pathway. I experienced some remorse after making the change because the iPad overheated on a couple of early flights. However, I found that keeping it on my left leg did an excellent job of protecting it from the sun and I flew many hours with it during the peak of summer without an issue. The iPad is a more capable flight planning tool and also works remarkably well in a pinch for aerial photography (e.g., the sunset photo above). The Bear became much more comfortable at the controls of the airplane. This year, she had a lot of fun busting clouds, taking the controls and shooting pictures. She flew 30.7 hours in 2013, surpassing the 200 hour mark to end the year with a total of 224.6 hours in the Warrior since infancy. In 2013, I logged my greatest number of flight hours ever, 128.6. This can be attributed to a mix of pleasure flying, instrument training, and cross country trips. 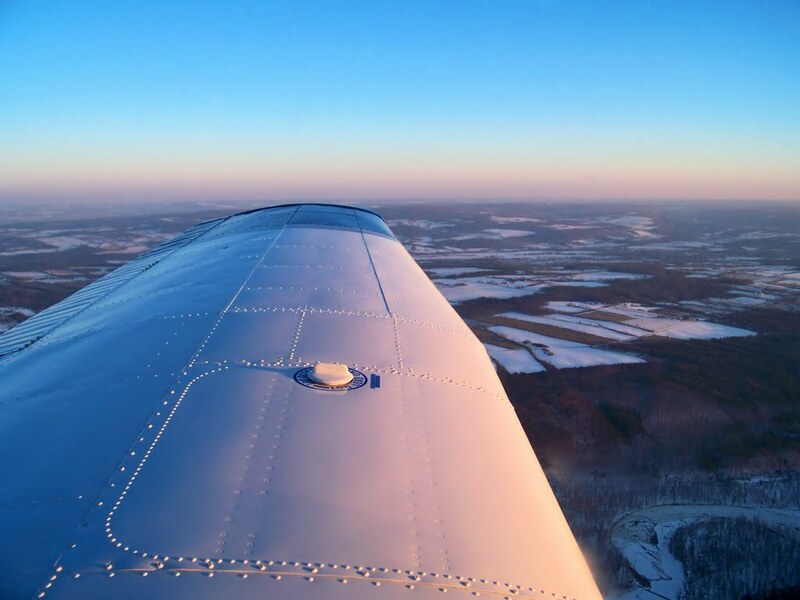 In July, as I neared completion of my instrument rating, I flew almost as many hours in a single month as I did in flying the family to Florida in 2005 and 2011. I also logged 10.5 hours of night flight in 2013, my most to date. I notice that my night hours are slowly creeping higher as time goes by. My family and I landed at First Flight Airport, completing a quest started in 2011. The landing at First Flight was part of of our annual family flying trip. We loved the Outer Banks. The Bear earned her Junior Flight Ranger badge at Wright Brothers National Memorial and swam in the Atlantic. Along the way, we flew through the Washington DC SFRA for the first time (twice! ), gained some actual IMC time, and had lunch with one of my favorite aviation bloggers. In July 2013, Warrior 481's Lycoming O-320 entered middle age: 1000 hours on the tachometer since the 2003 overhaul. I/we visited some great aviation museums in 2013: The Piper Aviation Museum (Lock Haven, PA), the Air Heritage Museum (Beaver Falls, PA), the Intrepid Air, Sea, and Space Museum (New York, NY), the Tennessee Museum of Aviation (Sevierville, TN), and of course, my extremely-biased favorite: the Air Zoo (Kalamazoo, MI). In addition to flying with The Bear, I made more of an effort to expose young people to general aviation. Emily, Maggie, and Ben (all college students) each spent some at the controls of Warrior 481. I also flew with a gypsy and did some outreach at my daughter's school. I had the good fortune to visit my old home base airport in South Haven, MI for the first time since 2008. In addition to New York, I landed in Maryland (1st time), Michigan, North Carolina, Pennsylvania, and Virginia. It is always difficult to forecast what the future will bring. As 2014 nears, I suspect that there may be even more profound change in store; call it a hunch. Happy holidays and best wishes for a high flying 2014 to all! As the occasional flurry spiraled earthward beneath a leaden overcast, The Bear and I readied Warrior 481 for a Sunday morning breakfast flight. This was no ordinary breakfast run, however. The Bear had an objective. "When can I use the camera?" she asked as I installed the winterization plate on the Warrior. It was her third time asking and bordered on nagging, but I understood that she was very excited. Before departing the house that morning, The Bear spied my old camera on my desk and asked if she could use it to take pictures from the airplane. I agreed, but still had the camera stored safely in my flight bag. With the door closed and latched, The Bear snugly buckled into the front seat, and the engine idling smoothly, I handed her my trusty old Sony digital camera. She carefully plucked it out of my hand, exhibiting a curiously contradictory blend of reverence and giddy enthusiasm. I trained her on its use before we left the house. She immediately switched it on and took her first "selfie". I paused my flight preparations to define "selfie" for her. During the engine run-up, I heard a giggle followed by, "I took a surprise picture of you!" I was evidently concentrating on the run-up and did not notice. Aloft, The Bear began snapping photos, even asking for turns so that she could see different elements of the late autumn landscape. "Ooo...I got a good one of our airport, Daddy!" And she did, too. The overcast dissipated beyond Oswego as though produced directly from the atmospheric discharge of the Nine Mile Point Nuclear Plant. 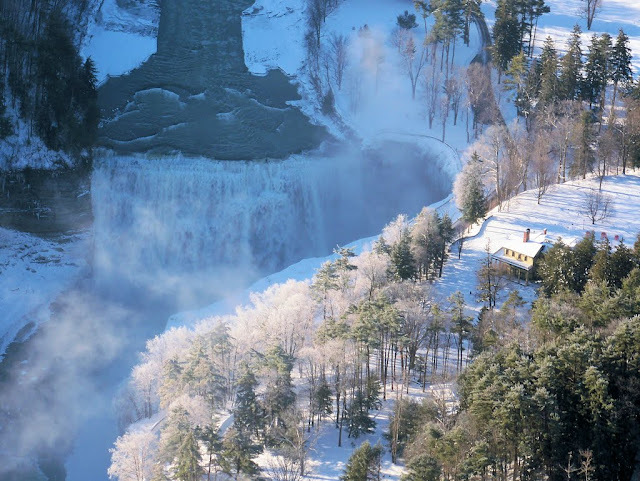 En route to the Oswego County Airport, The Bear held her camera at the ready, looking for just the right shot. I was reminded of my early days in aviation, snapping photos from the back seat of a Super Decathlon. It became clear that The Bear is just as fascinated by capturing images of flight as I am. When there was nothing particularly inspiring out the window, she created her own inspiration. We landed at Oswego County and sat down for breakfast at Puddle Jumpers. As we waited for our breakfast, The Bear jumped up and photographed the Warrior through the restaurant window. "I loooove my airplane," she commented later when we reviewed the pictures. Much fun was had with the camera during breakfast. Apple cinnamon pancakes were The Bear's choice of the morning. Right after she ordered them, she noticed that the owner was carving up an apple. If that is not a mark of authenticity, I don't know what is. When the pancakes arrived, The Bear demonstrated that she was ready to join the Instagram crowd by photographing her meal. After breakfast, we climbed above the clouds for a brief look around before returning to the gray world underneath. Near the Oswego River, sunbeams cast spotlights on the few residual pixels of autumnal color remaining below. Like clockwork, the cumulative somniferous effects of flying with a belly full of pancakes worked their inevitable magic. The Bear dozed off, still clutching the camera. Approaching the Williamson-Sodus Airport, I was disappointed that we had largely missed seeing much fall color from the air. I shut down outside the hangar and removed The Bear's headset. She did not stir until I undid her seatbelt, at which time she sat bolt upright and brightly exclaimed, "I JUST TOOK A LITTLE NAP!" At home, we reviewed all 79 images captured by her digital eye. I had her choose which ones we would keep and which ones we would discard. Showing good judgement, she sentenced thirty blurry shots to the abyss. From the survivors, she chose several to post on her personal blog and, for the first time, she wrote (rather than me ghostwriting) the captions that would be shared with family. The Bear had a blast during her first attempt at aerial photography. I hope she continues to have as much fun with it as I have over the years. Last spring, my daughter's school was studying transportation in all its varied forms (yes, the entire school, in a remarkable showing of curricular unity). Among various scheduled activities and visitors, the principal invited me to talk with some classes about aviation. Asking me to talk about flying is like...well...asking any obsessed prophead to talk about flying. No problem, right? Except that the target audience included three second grade classes and The Bear's class. It is not that I am an inexperienced speaker. I've taught college level courses, given talks at scientific conferences around the world, and even run tours at a world class aviation museum. But...how to engage kindergartners and second graders? As I contemplated my lesson plan, I decided on a few points that I wanted to make and collected photographs to emphasize them. I learned from the teachers that they had already covered the basic parts of airplanes and the four forces of flight. I have always been fascinated by how function dictates form with airplanes and realized that I could expand on this existing foundation. I introduced the term "powerplant" and asked the students if they could name at least two types, dropping a hint that two common types were depicted in the picture above. They had not really thought about the fact that piston (prop) and turbine engines are really there to achieve the same result. I asked the second graders what the engine and propeller did, calling on the first student that raised his hand. 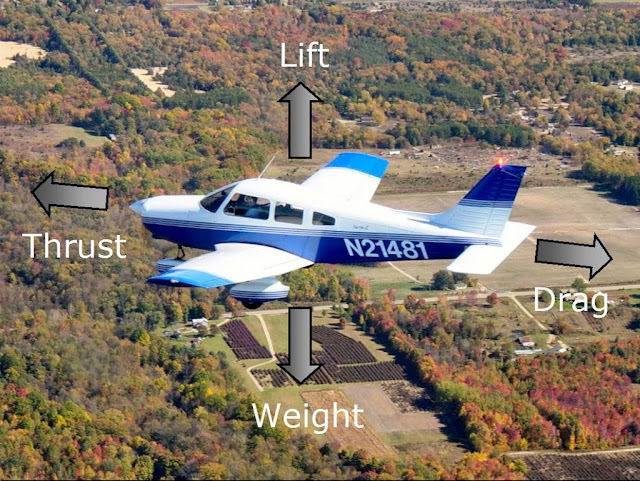 "They generate thrust that pushes the airplane through the air so that air goes over the wings to create lift." Wow. Yeah! He managed to answer a whole series of questions that I had not even asked yet. We reviewed the other forces of flight and major airplane parts before I asked my challenge question. "If the engine fails, does the airplane fall out of the sky like a rock? How many people think it will?" About half of the hands in the room went skyward. Expecting this, I switched my approach. "What does the engine generate?" "Thrust!" the group answered in unison. "So, if the engine quits, are the wings still attached?" Facial expressions revealed a flurry of eureka moments for the assembled students and adults as everyone got it. It was cool to watch. "The airplane becomes a glider then, doesn't it?" asked my star pupil. I nodded and explained a little bit about glide ratios and how altitude translates to more options in an emergency. I gave an example of how I could fly my airplane a few miles away from the airport, pull the power to idle, and glide it right to the numbers on the runway. This was a revelation to my audience. I transitioned to another favorite topic of mine: airports. 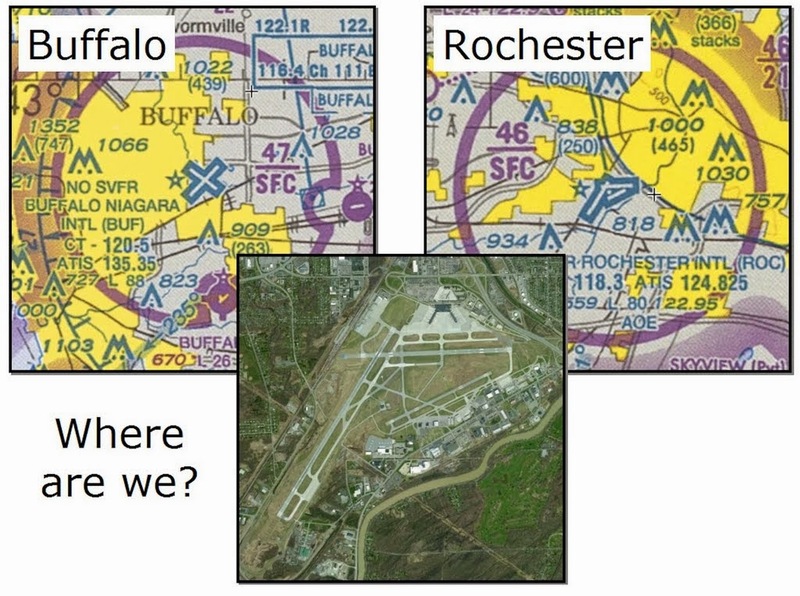 "How many airports are there in the Rochester area? How many people think just one?" Most of the hands in the room went up. One of the second grade teachers, whose father and brother are pilots, beamed at me with a knowing "I see where you're going with this" sort of smile. Prior to my visit, I was told by two different faculty members that some classes climbed aboard a private business jet during a recent a field trip (I was envious). The location was described by both faculty as being "down the street from the Rochester airport." I puzzled over this odd turn of phrase until it hit me that the general public (or at least this sampling of it) equates "airport" with the airline terminal, the big steel and glass structure with jetbridges, TSA checkpoints, and the ubiquitous Starbucks. 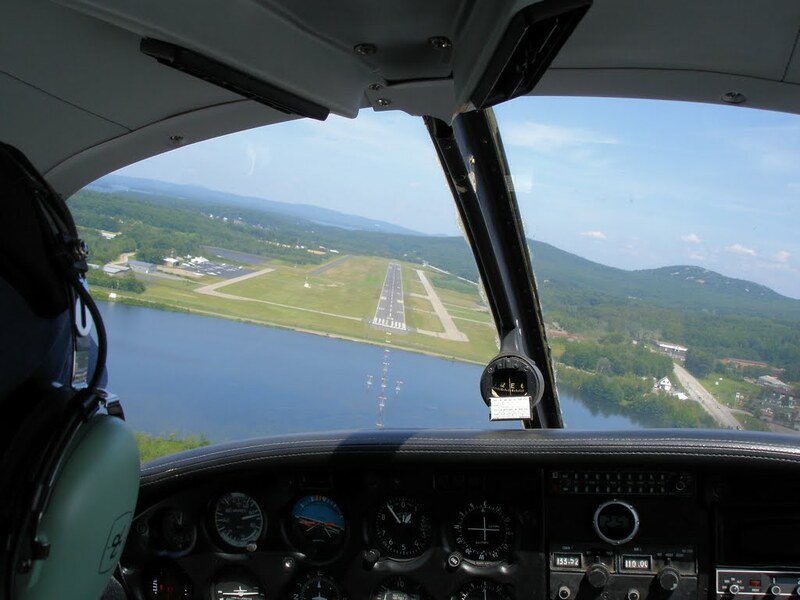 In contrast, pilots view airports as the entire facility: runways, taxiways, and associated structures including the terminal building. 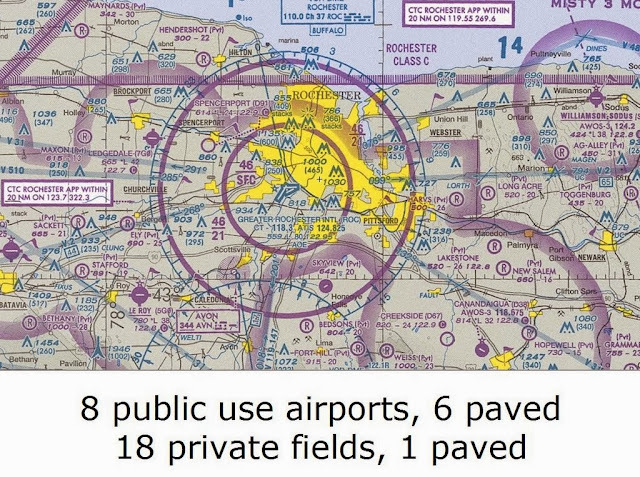 No wonder smaller airports like Williamson-Sodus or Le Roy don't get any respect, or even recognition as proper airports! 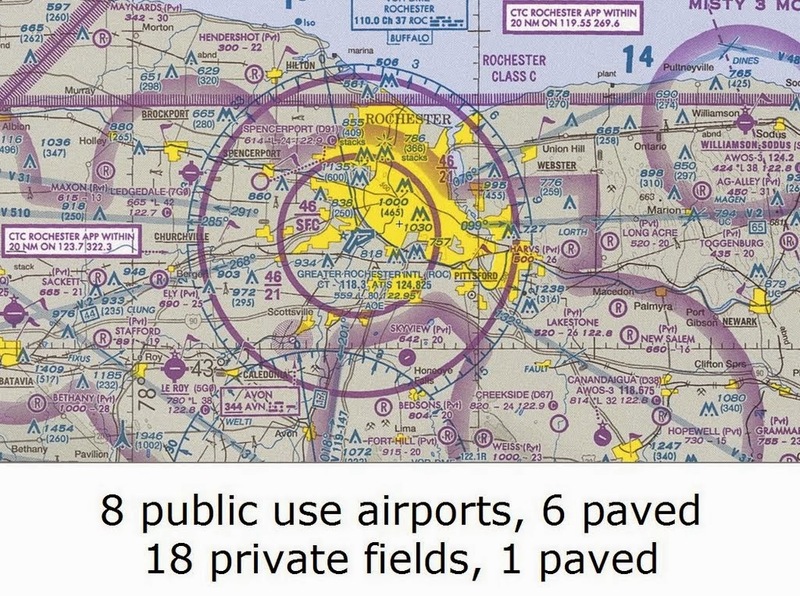 It was time to raise awareness about general aviation airports. With the above photo on the screen, I asked the students, "what is the only thing an airport actually needs to be an airport?" With the answer staring them in the face, they had no problem keeping up with me. "A runway," a student answered. "Right!" Then, switching to a new photo, I noted that, "pavement is not required." I explicitly pointed out that control towers, fancy terminal buildings, and Starbucks are also not necessary parts of airports. Looking at the sectional chart, we counted the number of airports in the immediate Rochester area, including Greater Rochester International. The final sum was significantly more than one! This provided a great segue into my next topic: charts. From my wife, I learned that the second graders do a unit on maps. I took the opportunity to connect my presentation to the existing curriculum by introducing sectional charts. 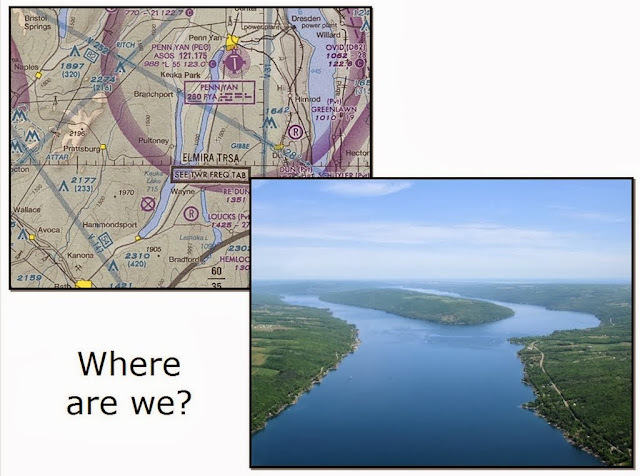 I let the kids in on a secret: that aviators don't actually use "maps", they use "charts". "If your parents ever say 'map' in relation to flying, make sure you correct them!" The students, particularly the kindergartners, giggled about being let in on some serious pilot vernacular. I demonstrated how detailed the charts are with examples of how pilots can navigate simply by looking out the window, noting that the shoreline of Lake Ontario is one of the greatest visual navigation aids any pilot could ever want. I left a stack of expired sectionals with the teachers and noted that two were already hanging on the wall of one classroom before I departed the school that day. A unique perspective on the city familiar to them all. A warm perch above a frigid winter scene. It is always so much more interesting to be above fog than in it. Flying amongst the peaks of the Rocky Mountains. Peering down through the clear water surrounding the Florida Keys. Sunsets witnessed from above the clouds. And, finally, the existence of obscure physical phenomena like glories. I closed with this image while answering my own question. "Why do I fly? Because it's fun!" My daughter's classmates turned to her with wide eyes. 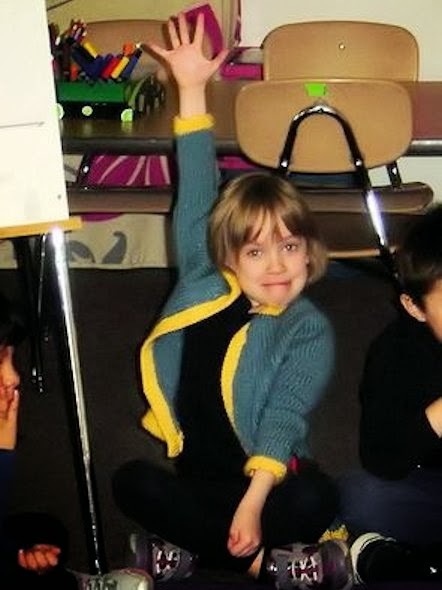 In the second grade session, one of the students commented, "hey! I know that kid! Cool!" Overall, I had a great time. The students were well-behaved, enthusiastic, and engaged. The principal took photos of The Bear's class that showed them hanging on my every word. I admit that I frustrated The Bear, though. She more or less looked exactly like this whenever I asked a question and I usually left her hanging to call on one of her classmates instead. I warned her in advance that I would do this. After all, she already knew all the answers. And now, some of her fellow students do, too.